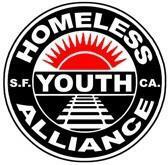 Homeless Youth Alliance (HYA) is a lifeline and support system for young people living on the streets of the Haight Ashbury and Castro districts of San Francisco. Our mission is to meet homeless youth where they're at, and to help them to build healthier lives by empowering them to protect themselves, educate each other, reduce harm within the community, and transition off the streets. We provide a full continuum of human services, including street outreach, one-on-one case management, direct referrals, HIV and HCV prevention and education, and medical and mental health care to homeless teens and young adults. To quote Bevan Dufty, former Director of the Mayor's Office of Housing, Opportunity, Partnership and Engagement (HOPE), "HYA does tremendous work with kids no other agency can reach or work with." We build a frontline workforce that mirrors the youth we serve. Almost all members of our Outreach Team are formerly homeless and/or have been members of marginalized communities. Since commencing operations, we've hired 12 former participants and appointed 2 to our Board of Directors. We run our programs with the help of 25 volunteers, most of who are former/current participants. After running an indoor drop-in center, medical clinic and needle exchange on Haight Street in San Francisco for 12 years, HYA became a mobile program in 2013 when property owners terminated our lease with only two months' notice. Since then, despite excellent references and strong financials, we've been unable to find a property owner in the neighborhood willing to rent space to us for use as a drop-in center for youth. The stigma and fear against homeless young people in the Haight, coupled with a shortage of appropriate rental options in this neighborhood, has left our services homeless. Still, we have refused to abandon the youth who need our services to survive. Since 2013, we've transitioned to providing all of our services on a mobile basis. Even under adverse and extremely challenging conditions, we're making a substantial difference for youth in need. Our 6-member Outreach Team engages with 850 homeless youth per month. Since losing our drop-in center in January 2014, while operating as an entirely mobile program without a physical indoor space, we've placed more than 40 youth in permanent housing, tested over 550 for HIV and HCV, provided medical treatment to more than 1,200 youth, and provided therapy and psychiatric treatment to approximately 1,100 youth. Recently, we received a note from a former HYA participant, Erik. When we first met Erik, he had just come to San Francisco after a childhood spent bouncing around group homes and foster homes in his native Tennessee. Living in Golden Gate Park, Erik self-medicated his pain and despair with heroin. Friends brought him to HYA’s drop-in center and syringe access site, where he could get a hot meal, clean clothes and a shower, and learn how to protect himself from overdose and HIV. When Erik was ready, we helped connect him to a treatment program, as well as medical care and housing. Today, he’s back in Tennessee, a proud father of two beautiful daughters, working as a successful tattoo artist. Without our drop-in center, Erik would have remained disconnected, isolated and without a safe refuge to reconsider his options and the direction of his life. These days, that resource, which was so precious to Erik, is lacking in the lives of the Haight's homeless youth. Even as we continue making a difference to thousands of youth with our mobile outdoor services, HYA's ultimate goal is to restore indoor drop-in services to the Haight Ashbury, where they are so desperately needed. Homeless Youth Alliance is fiscally sponsored by Tides Center.